Our brand new Walk to fitness Treadmill is a great way to workout at home or office, improving cardiovascular fitness, general conditioning and toning lower body muscles. So whether trying to lose weight, tone up or simply stay in shape, this running machine is ideal. This treadmill comes with a LED display, you can see the distance, calories burned and speed for easy reference. 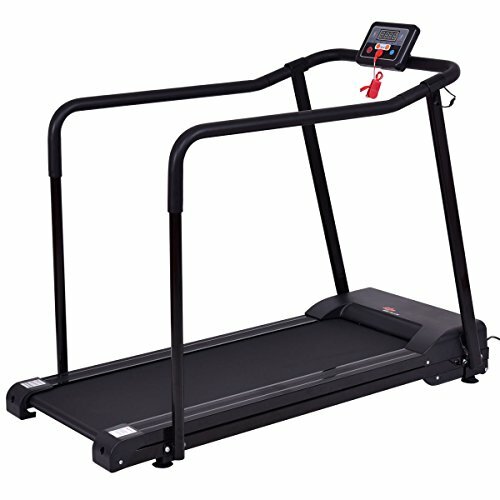 It features extra-long safety handles ,which is more than 2x the length of other typical treadmill handles. It's a wonderful choice for old people. Don't hesitate to add it to your cart! 【Perfect for elders】 Goplus elder treadmill is designed with two extra long arms,which are wrapped strong foaming can effient prevent accident while elders workout on the belt. 【Solid Construction】Frames are made of hight quality steel,this walking machine has 220Lbs weight capacity, 45.5" x 15"(L x W) ruuning belt provides you more comfortable and more sturdy workout experience. 【Foot Pads Design】Features foot pads to protect floor and achieve damping. 【Safety Guaranteed Design】Safety Key connect you and the machine, treadmill emergency stop system will start while any emergent problems happens. 【LED Display Screen】Easy to read LED screen indicates time, speed, calorie, distance, mode, keep track of your performance and monitor your progress.